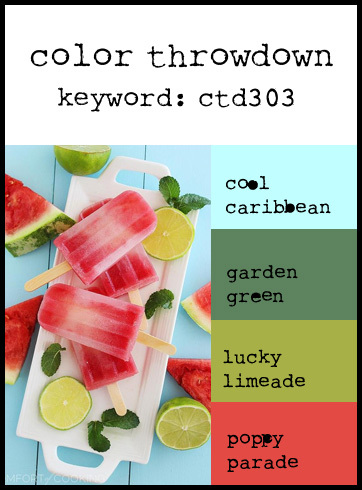 It's time for The Color Throwdown challenge for the week, so I have a card to share with you using the new color palette. I wouldn't really think to use this week's color palette together, but then I saw this patterned paper, and it actually has ALL the colors in it. So I guess it's a natural after all. My sentiment is actually a rub on. I've been trying to use my stash on cards, and if it's a rub on, I'm sure I've had it for a while! But it worked so perfectly, so I am glad I saved it. Here is the color inspiration for the week. And remember, you don't have to have the exact colors. They want you to use the closest match you have. I never have the exact colors, but I always play along...and you should too! Anita, the background paper is from Glitz Designs. I wish I had more of it!!!! What beautiful paper, Susie, and I love how you added the little heart...this is sooo sweet!!! Thanks for joining us for the Color Throwdown!!!! What a beautiful card, Susie! 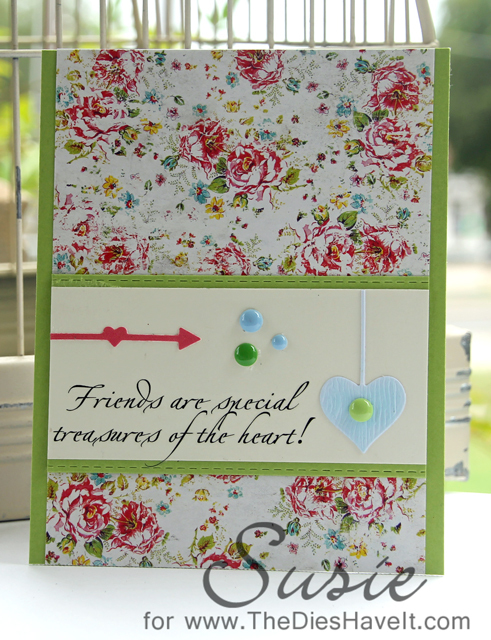 That is great background paper and I love your little hearts and enamel dots! Thanks so much for playing along with us this week at the Color Throwdown!